What does the Festive Season mean to you? I know it's only September, but bear with me. As a kid, growing up in the English countryside, it was all about Christmas for me. Things started to get interesting from 1 December each year, when the advent calendar was brought down out of the roof. No chocolates, toys or gifts involved - just the small arguments about whose turn it was and the excitement of seeing what was behind the little paper door each day. Soon after, the Christmas cards would start to arrive from friends and family both near and far. By the time Christmas Day came around the shelves would be jam packed with cheerful "Merry Christmas" and "Happy New Year" messages. Next would come the preparations for the Christingle service - decorating my orange with cloves and ribbons. And I clearly remember the concentration needed to carry the lighted candle through the church without tripping on the uneven floor. Then came Christmas Eve and decorating the Christmas tree - getting to put my mum's beautiful antique angel on the top was always a real treat - it was the icing on an often over tinselled cake! I have to say, my Christmas tree tends to look a little more sophisticated these days, but decorating it is still something I await with anticipation every year. One more sleep...and finally, the big event! Time to open all of those wonderful presents, gorge on massive amounts of scrumptious food, watch the Wizard of Oz or the Sound of Music on the telly, and then have crumpets toasted on the fire before heading to bed a very tired but happy girl. Boxing Day was always an adventure in our house too. After the indulgence of Christmas Day, we'd head out somewhere for some fresh air and exercise. I remember a trip one year to Gibraltar Point - a nature reserve on the Lincolnshire coast just south of Skegness - that involved a bracing walk along the beach in the driving rain/sleet and some misplaced car keys. There might have been some somewhat damp and not too happy campers heading home that day. These days, I still love many of the same things about Christmas, but I also have a deeper understanding of what the Festive Season means for others - whether that meaning is based on deeper religious beliefs, different religious beliefs, purely an appreciation for a few extra days off work, growing up in an environment where barbecues are the norm rather than an open fire, or something else. I've been thinking about this quite a lot over the past couple of months as I've been developing the designs that will be featured in the Paper-Roses Festive Shop (coming soon at www.paperrosesdesigns.com). Although some of the designs are very much Christmas oriented, others are perfect for the many other important celebrations, like Diwali, Hanukkah and the Winter Solstice that take place over the Festive Season, or for sending your love just because you can. 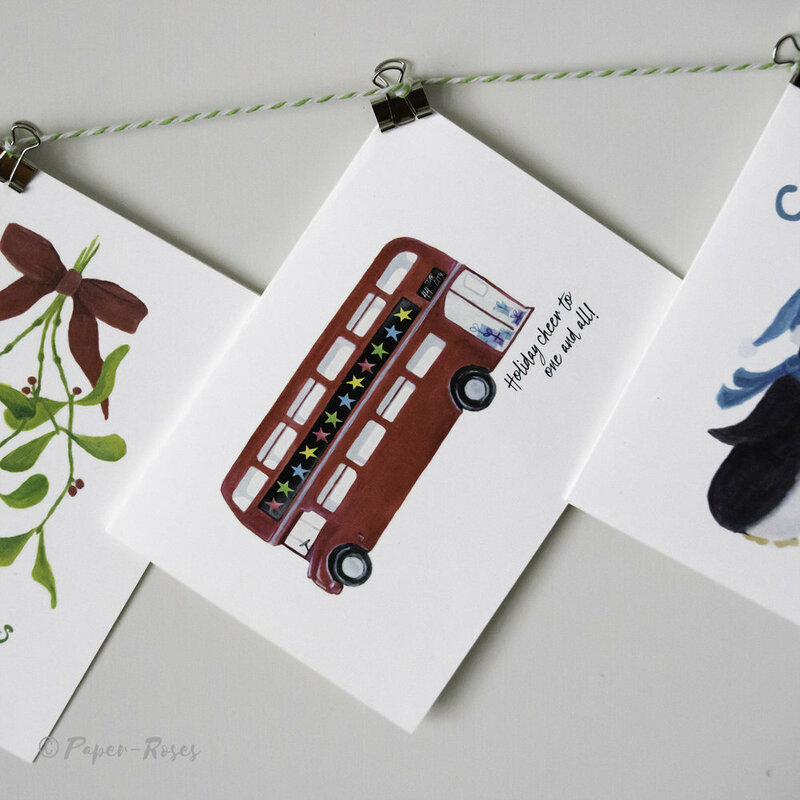 Here's a sneak peek at some of the designs that'll be featured in the Festive Shop. I'd love to hear what you think about these designs - which ones you love (or don't) and why. Let me know in the comments. They're all juicy and delicious!